Slowly but surely we’re moving to an era immortalized by Blade Runner where robots become our boon companions and electronic friends with benefits, a helpmate and, in the cold reaches of deep space, a tender lover. Take Luna, for example. She is a robot made by Schultze Works for a company called RoboDynamics. If she is real she seems to be able to move in multiple directions and has special hands that can be placed in any position for various activities including the all-important “tray holding” position so she can swirl through the crowd crowing about “Long Island Ice Teas” while the government’s top brass slowly get drunk. No word on availability and the website is sufficiently generic that it could have been put up in a few hours. It seems Luna will be coming soon and she will be available in standard and editions limited to 1,000 pieces. 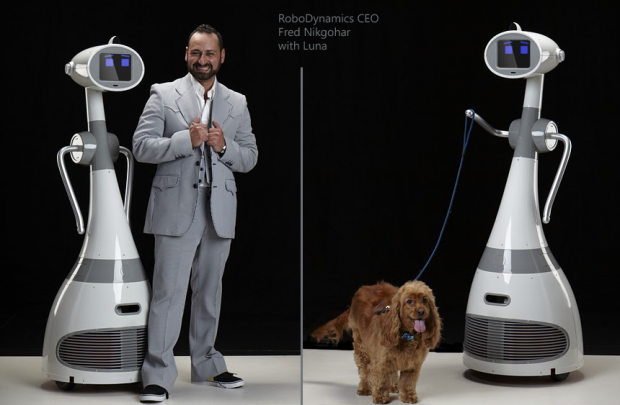 The robot has, according to the Schultze website “(1) completely expandable via expansion ports, (2) fully programmable with open standards and, above all, (3) affordable.” RoboDynamics is run by a former investor named Fred Nikgohar.